Wash salad vegetable, spin and drain water easily and quickly in few simple motions, add and drain water without removing the lid. Non-skid base, 5 L large bowl, lockable colander basket for easy take-way. Handle folds flat for space-saving storage. Pieces come apart for easy cleaning. Dishwasher safe. BPA-Free clear bowl is perfect for serving salad straight to the table, and saving salad in refrigerator. Beyond the Amazon's A-Z claim protection, you are backed Surpahs' 100% satisfaction guaranteed program, welcome to compare. 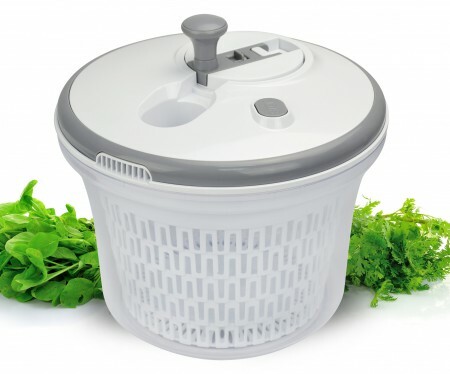 Surpahs 5L Non-Slip Salad Spinner is a great kitchen gadget for both washing lettuce, vegetable and salad and getting the excess water off. It comes in three parts - the bowl, the colander and the lid. The lid of this spinner has a water-in slot and a spout, allows you to put water in the bowl for spinning and cleaning vegetable, and easily drain out all excess water by simply pouring without the need of removing the lid. The Salad Spinner is also a good container to store salad in refrigerator after wash, when lettuce is washed and properly stored, it stays fresh in the storage in refrigerator for about 5 to 6 days.